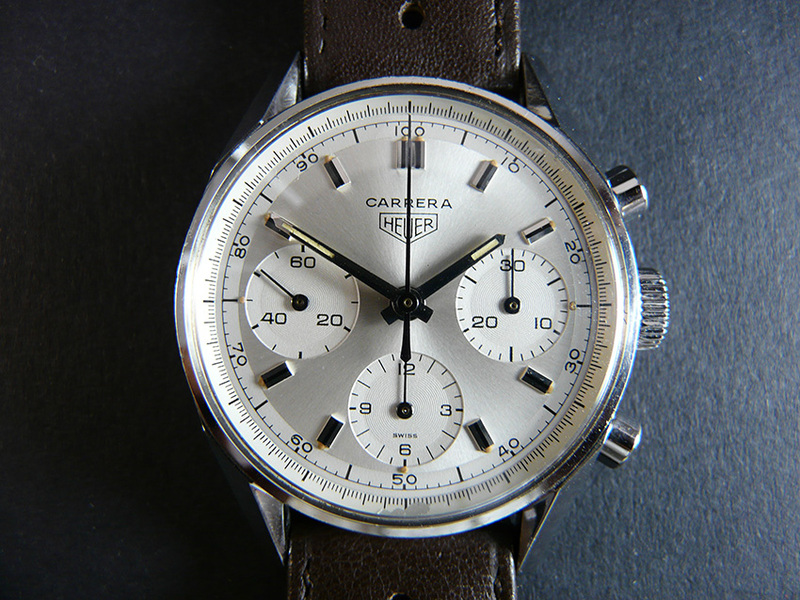 Heuer Carrera is one of the best-known sportchronographs in watchmaking history. 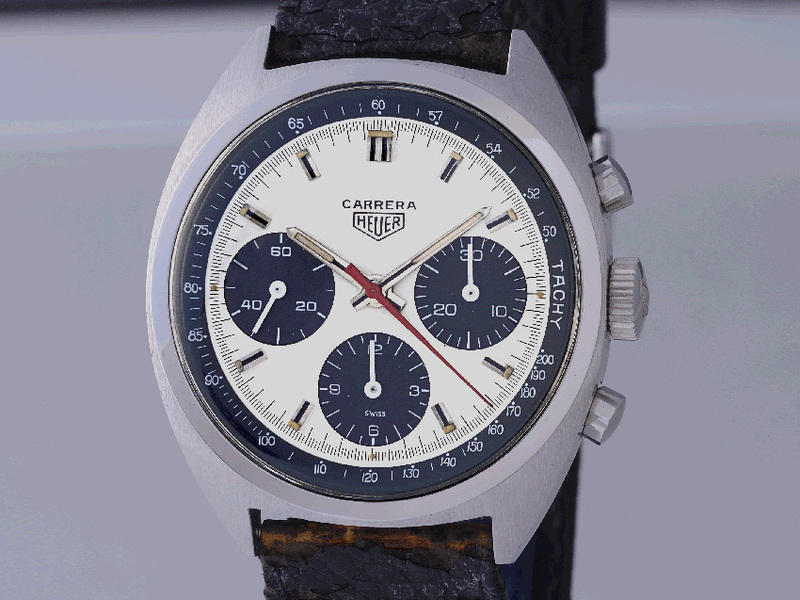 One of the great racing drivers in his days Juan Manuel Fangio was ambassador for Heuer and was wearing the Heuer Carrera. 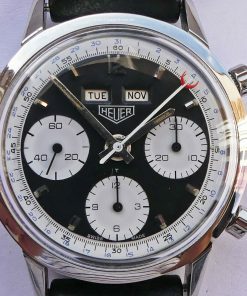 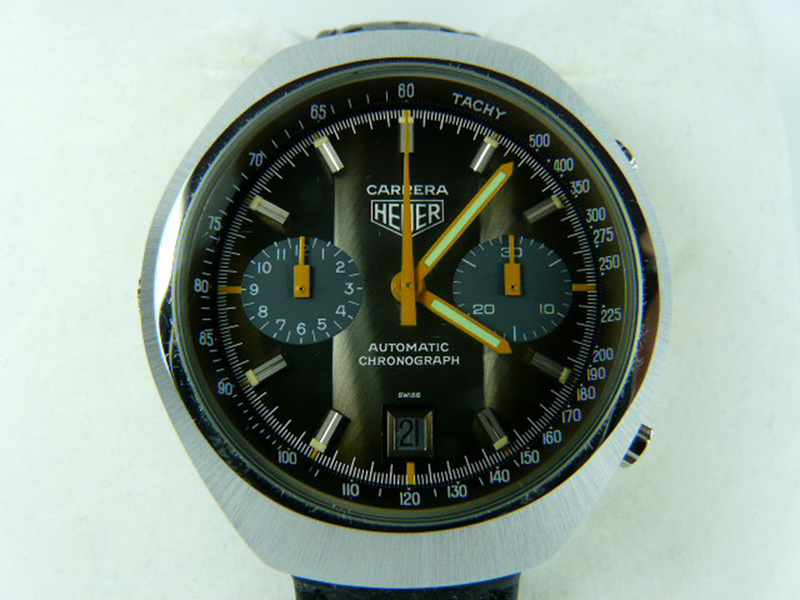 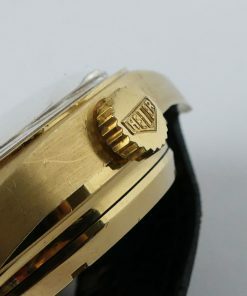 Heuer was inspired to this name by the "Carrera Pan Americana" the most dangerous car race of the 1950ties won among others by Juan Manuel Fangio. 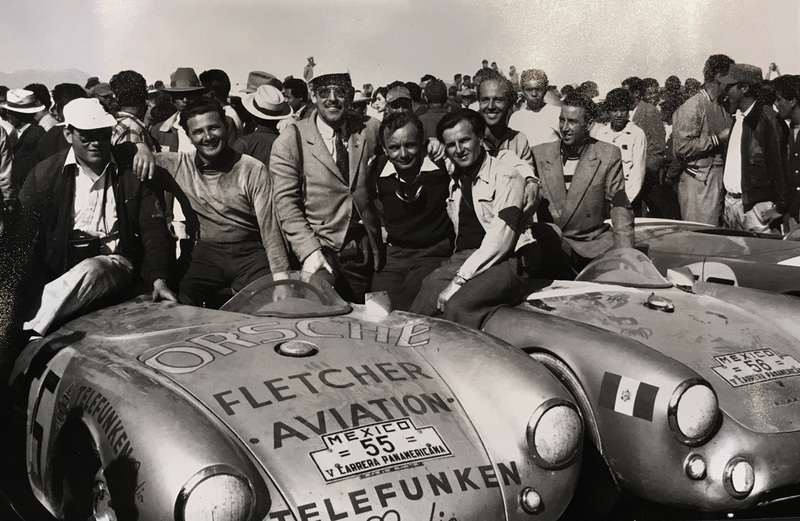 Porsche sport cars were participating this terrible battle to win for the gains in prestige and image. 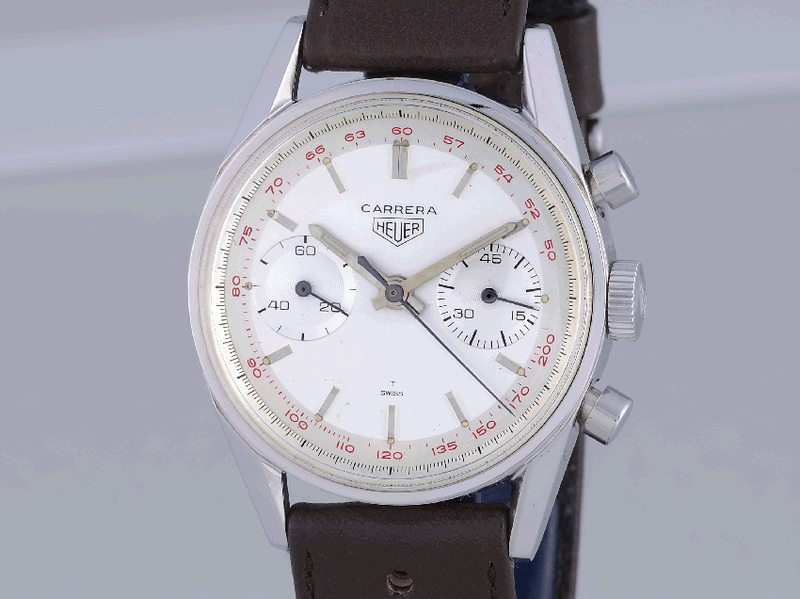 Since that time, Porsche has named tis innovative, fastest and most successful racing models "Carrera". 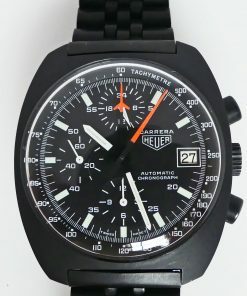 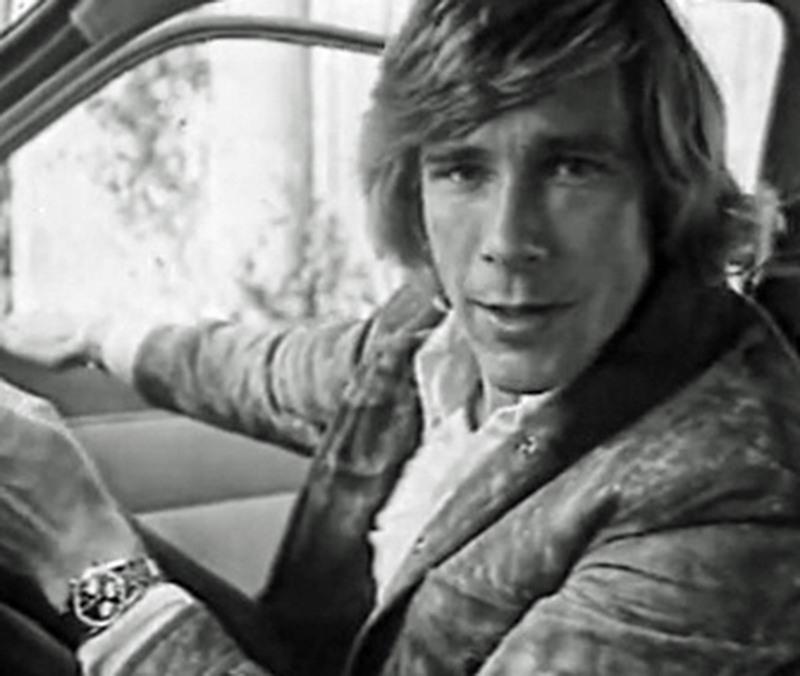 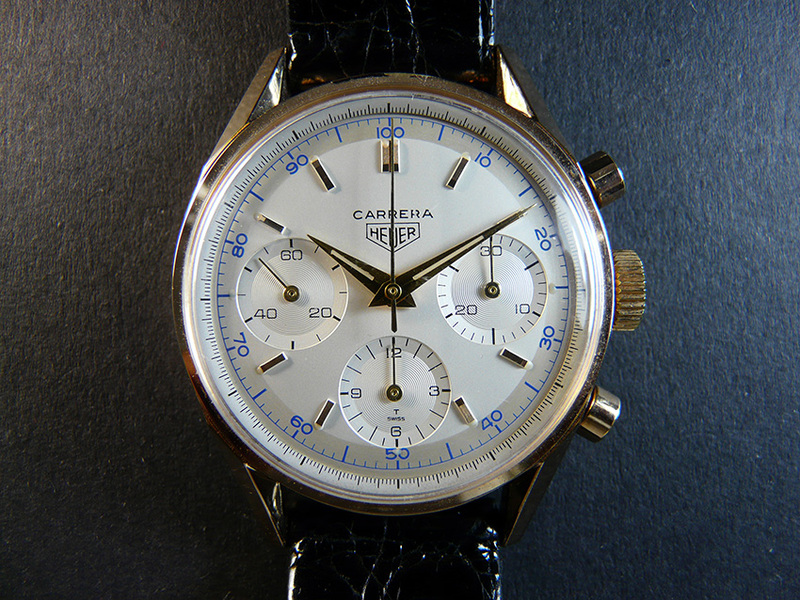 This link between the watches of Heuer and motorsports is remarkable. 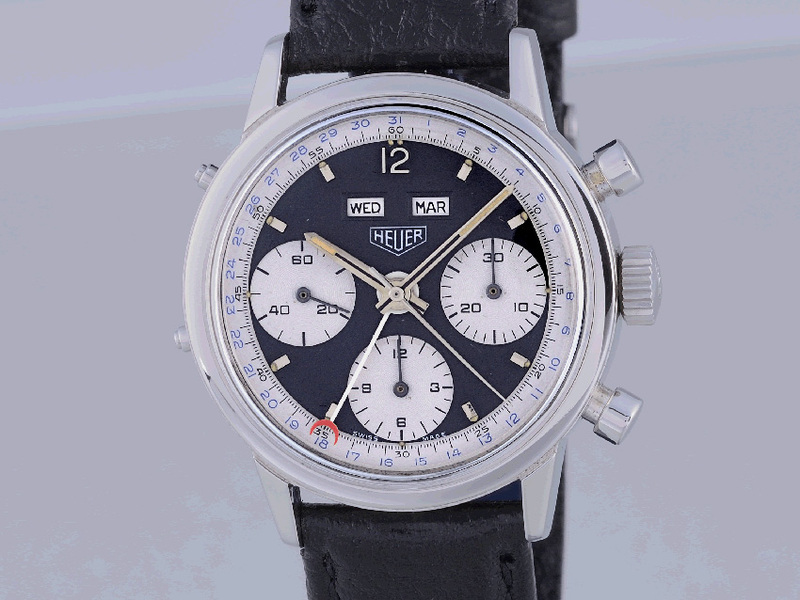 During the development of Heuer Autavia in 1962 Heuer had the idea to create a new chronograph for drivers and motorsport fans. 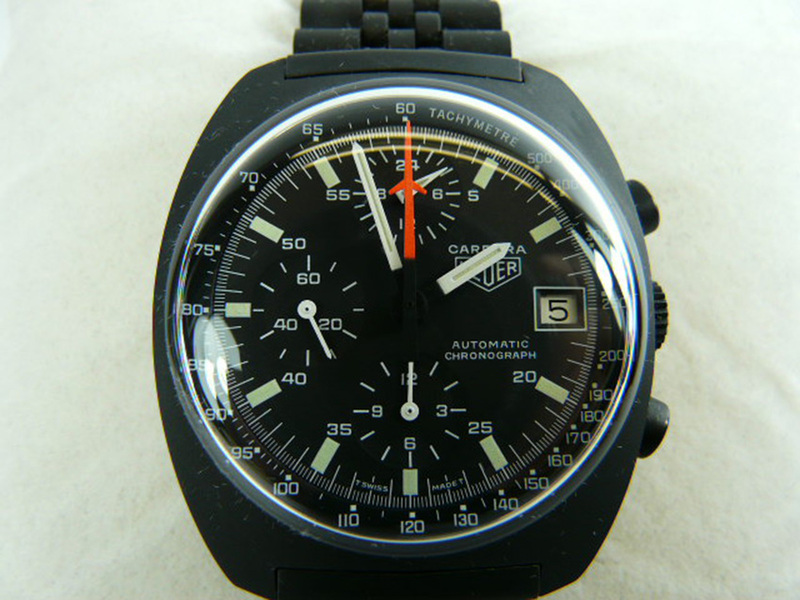 It was important that it be easy to read, shockproofed, anti-magnetic and waterproofed. 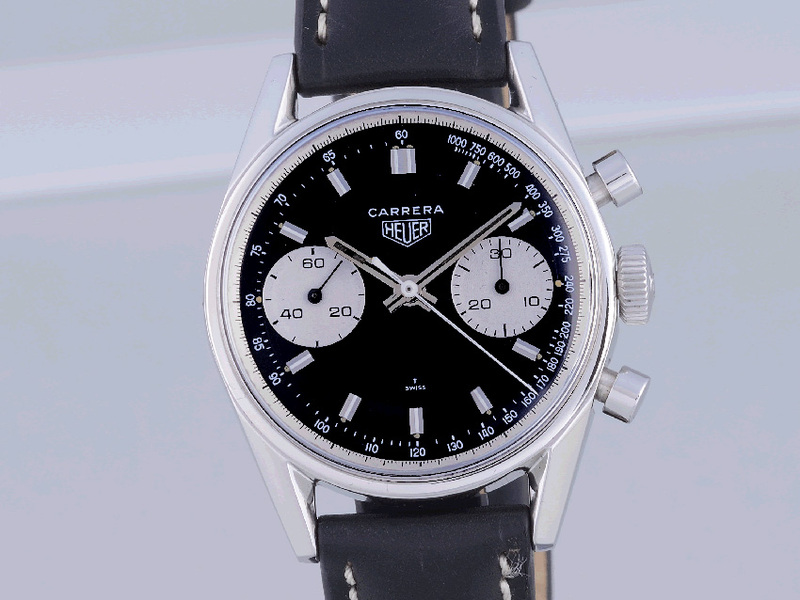 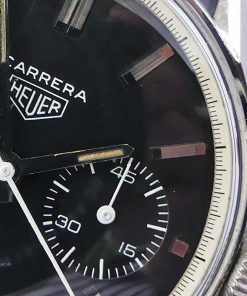 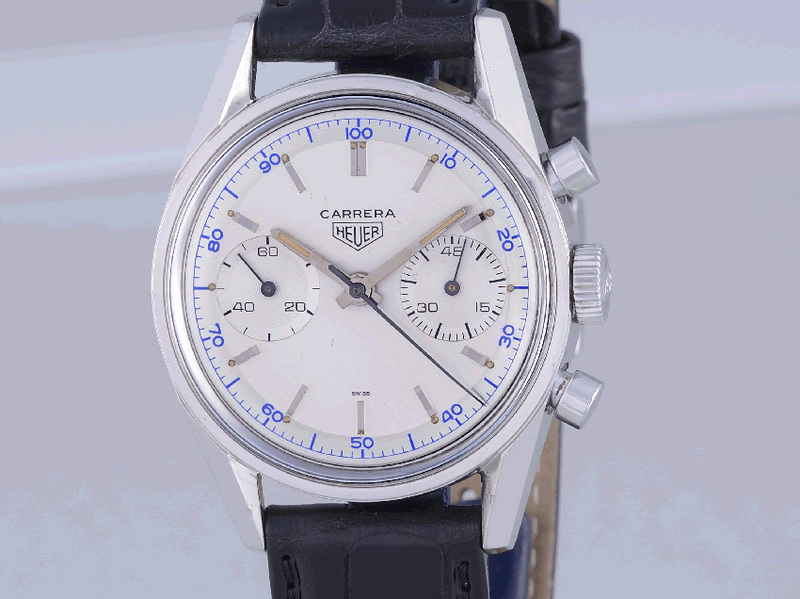 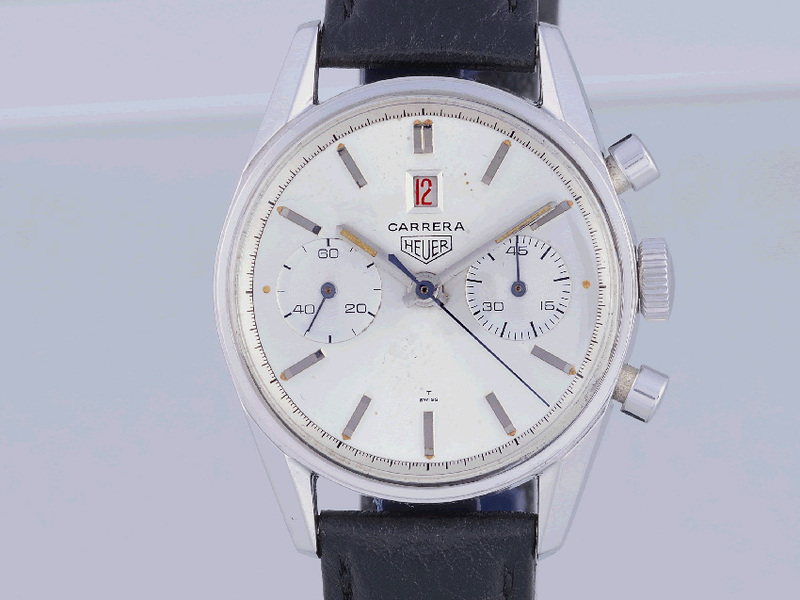 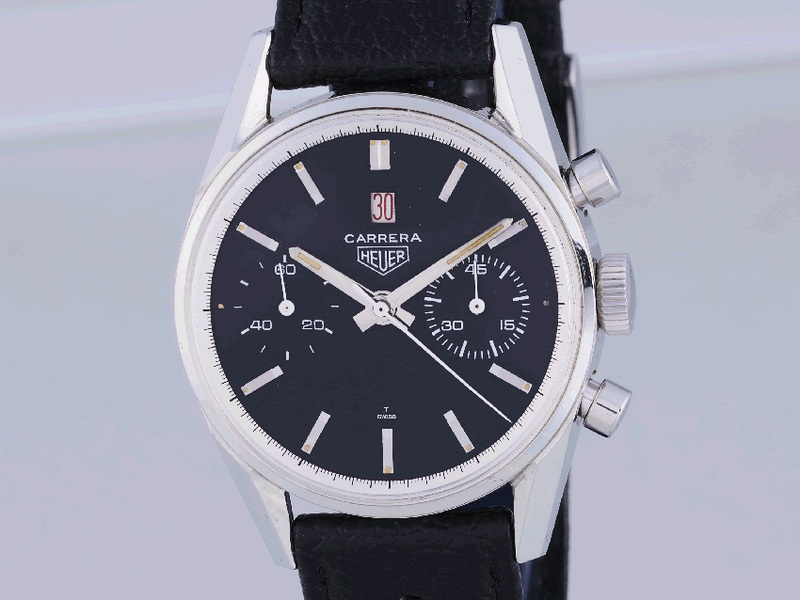 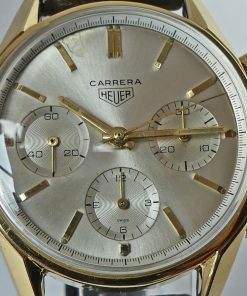 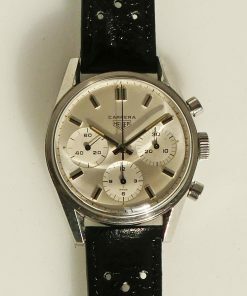 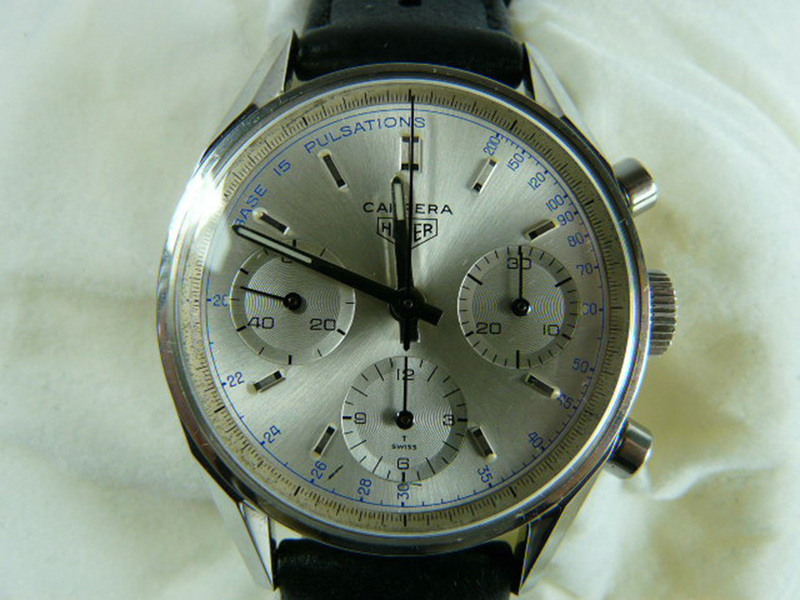 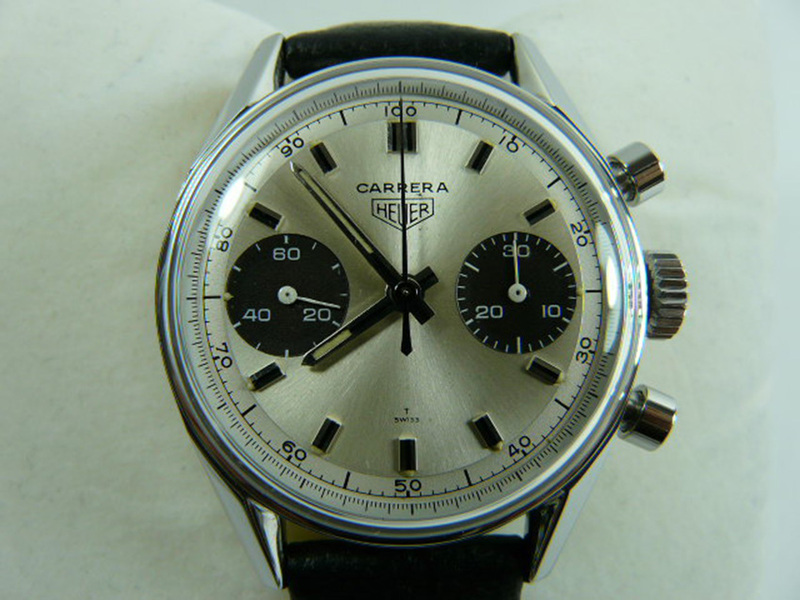 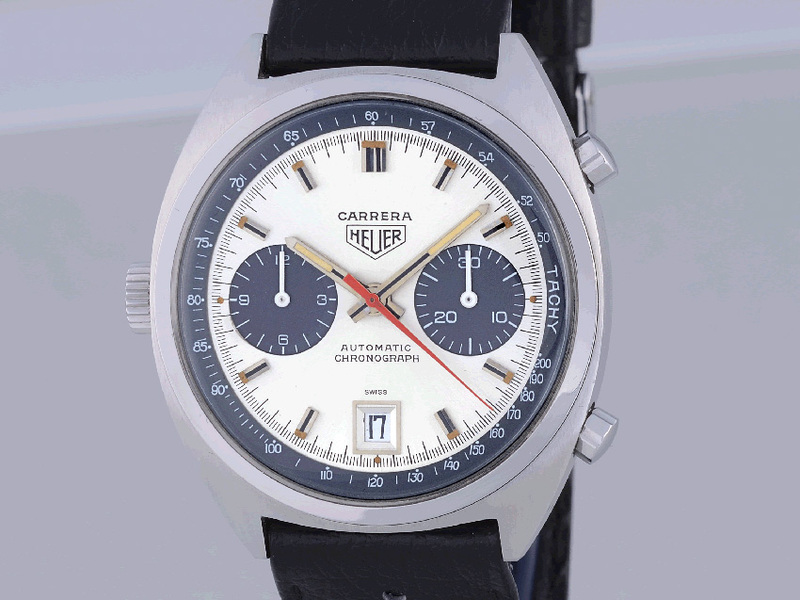 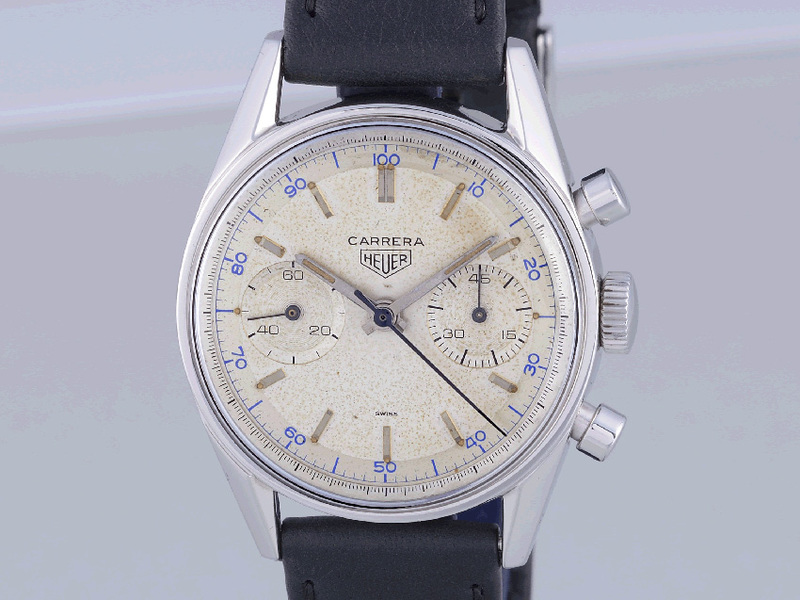 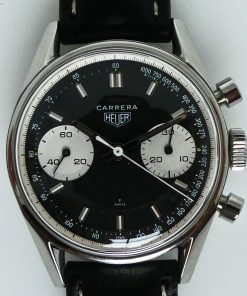 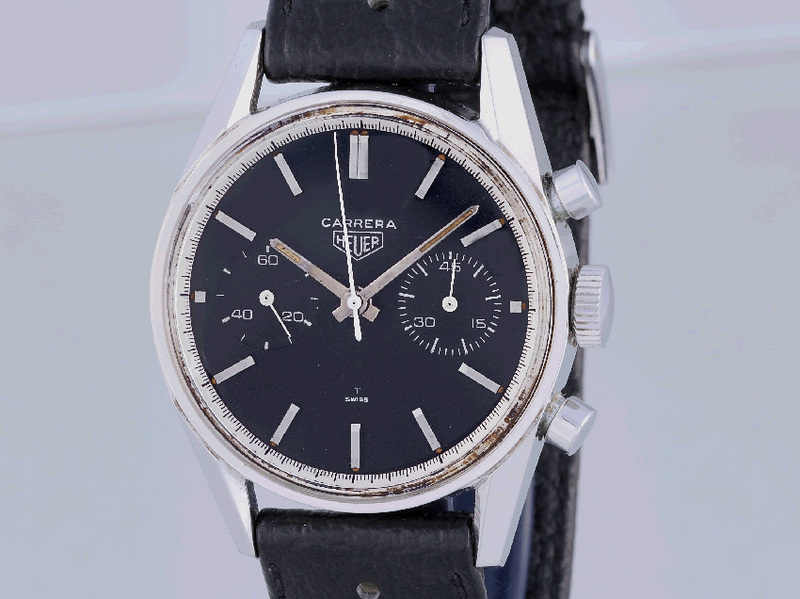 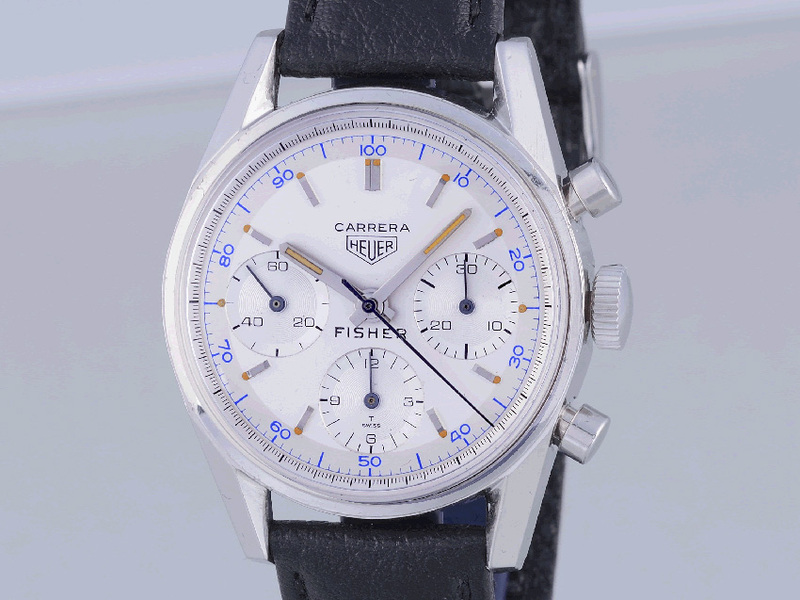 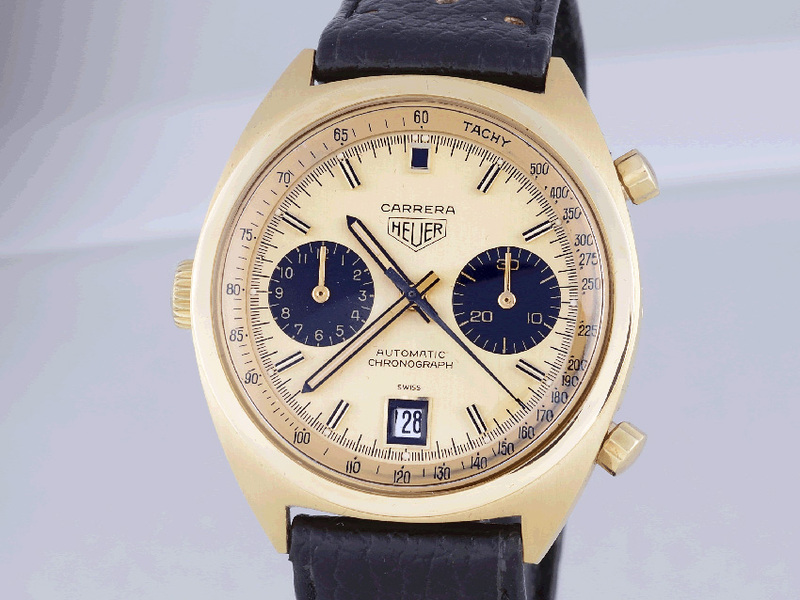 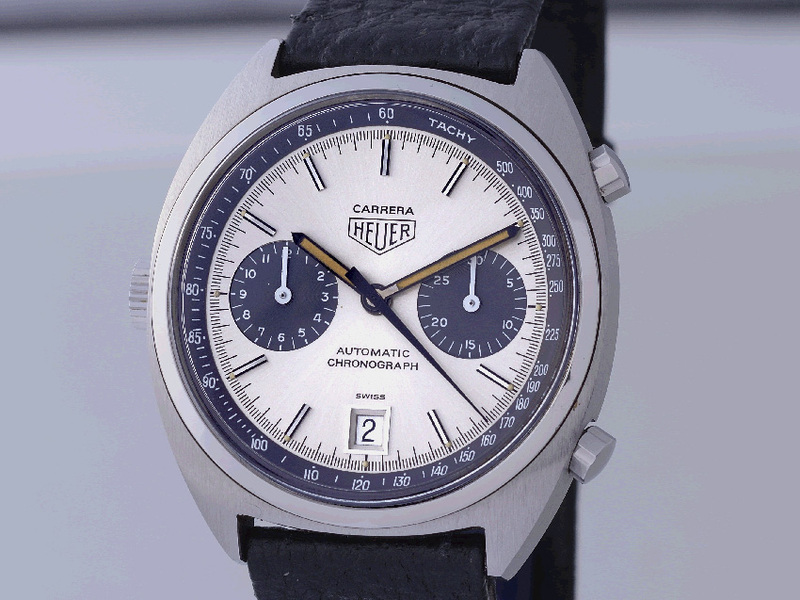 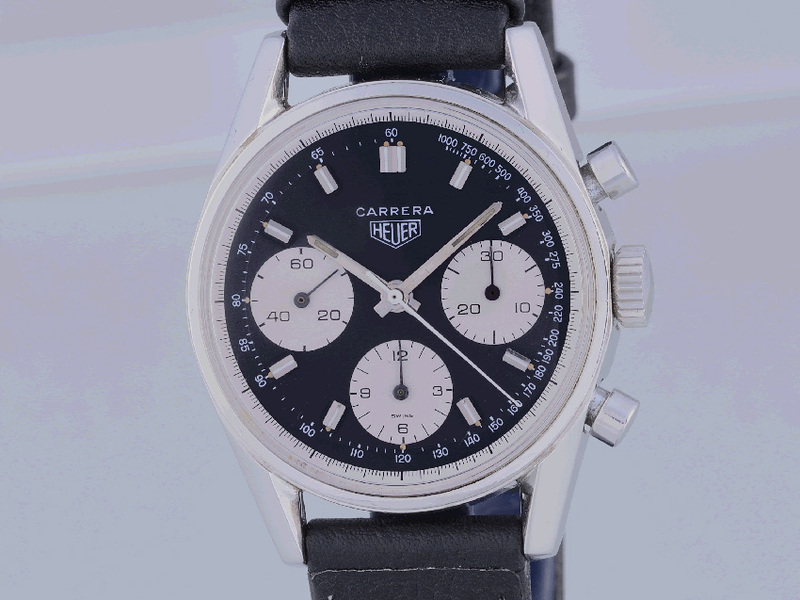 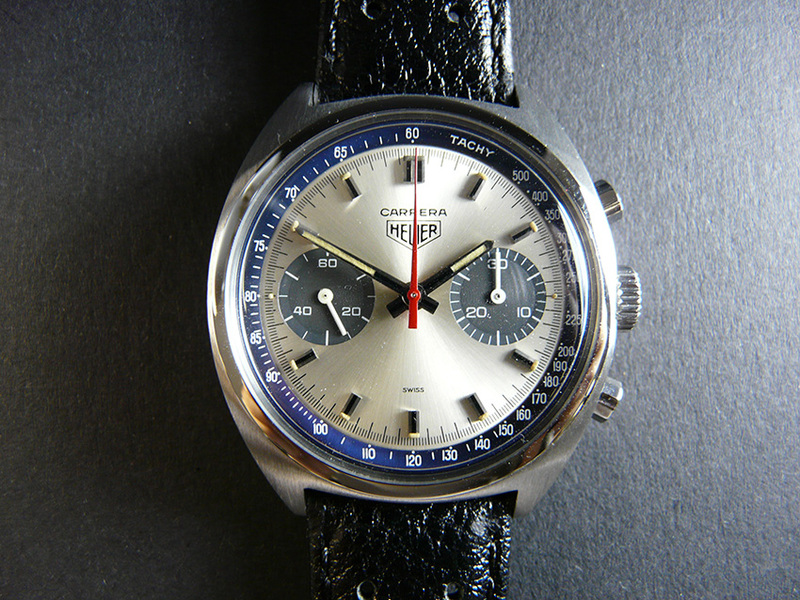 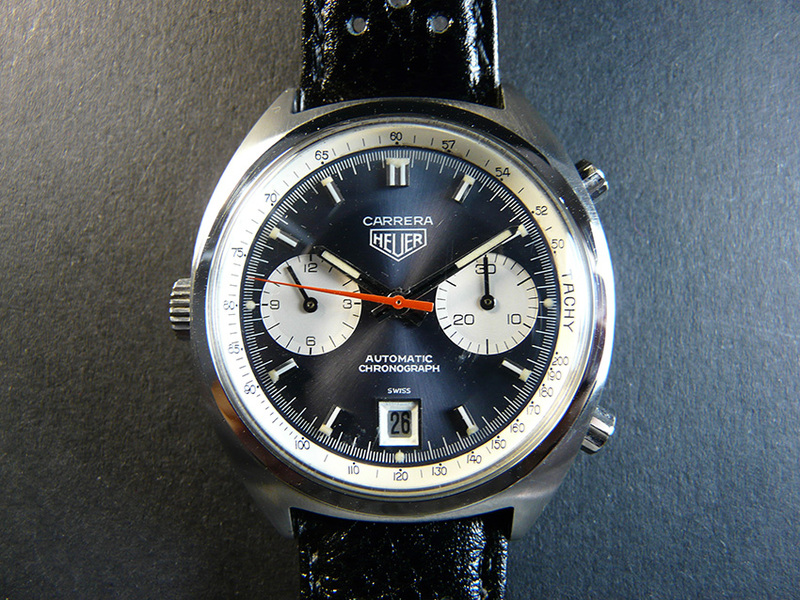 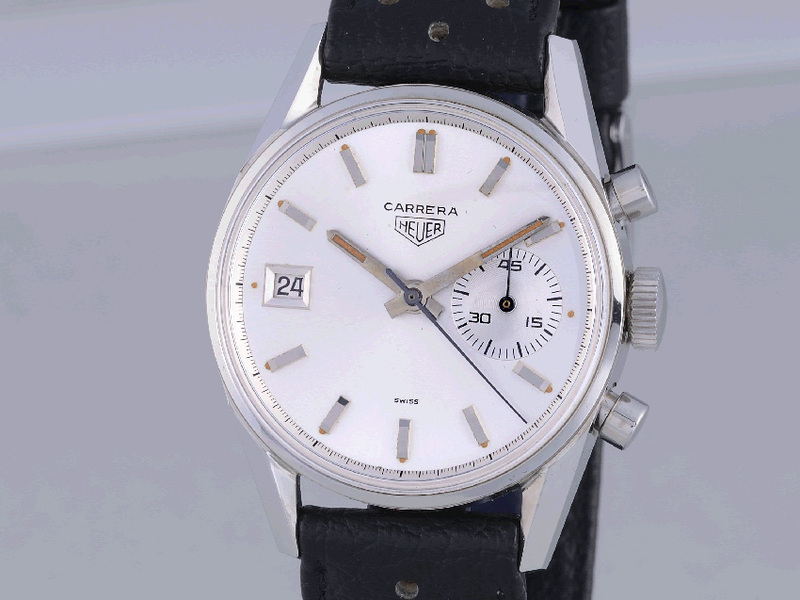 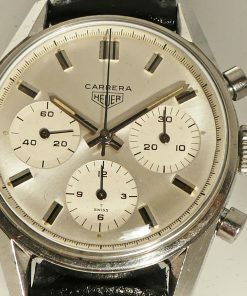 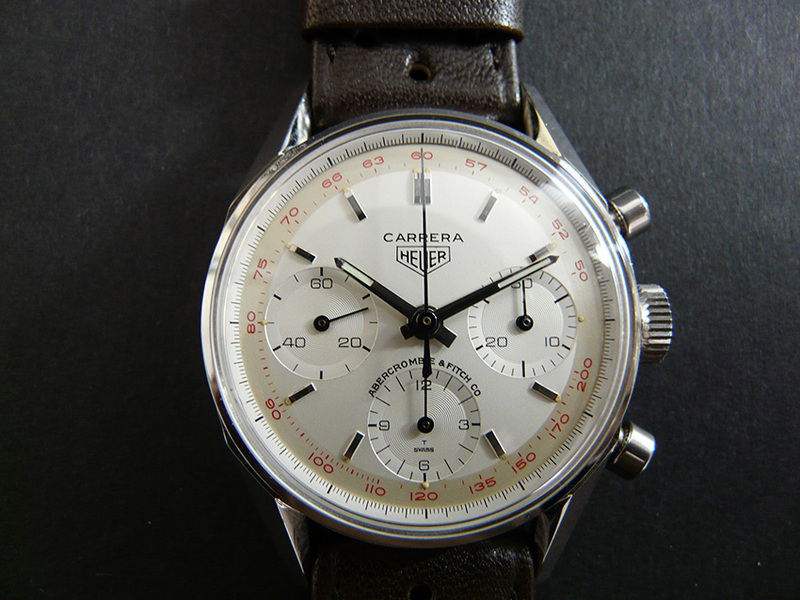 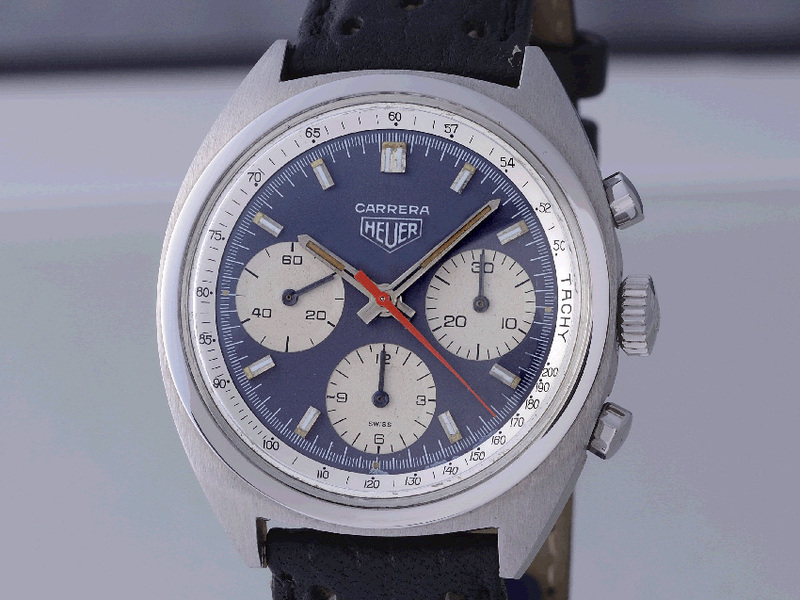 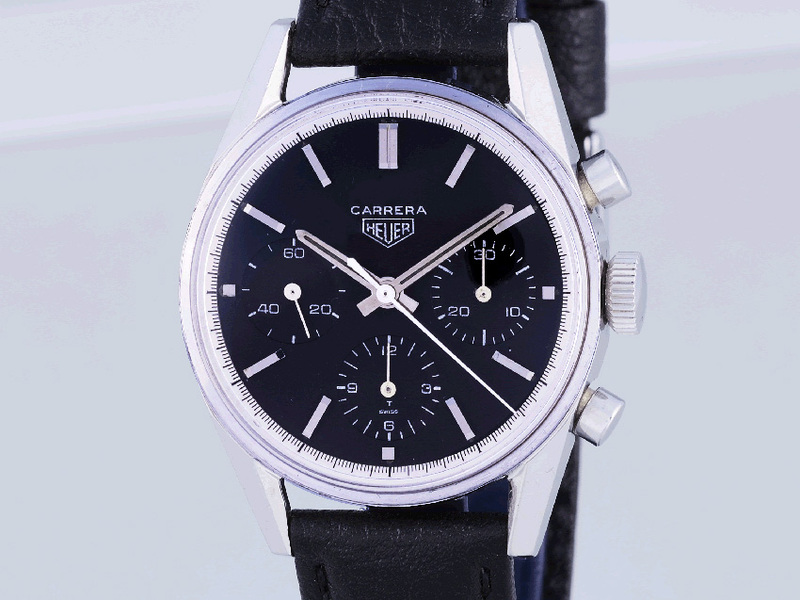 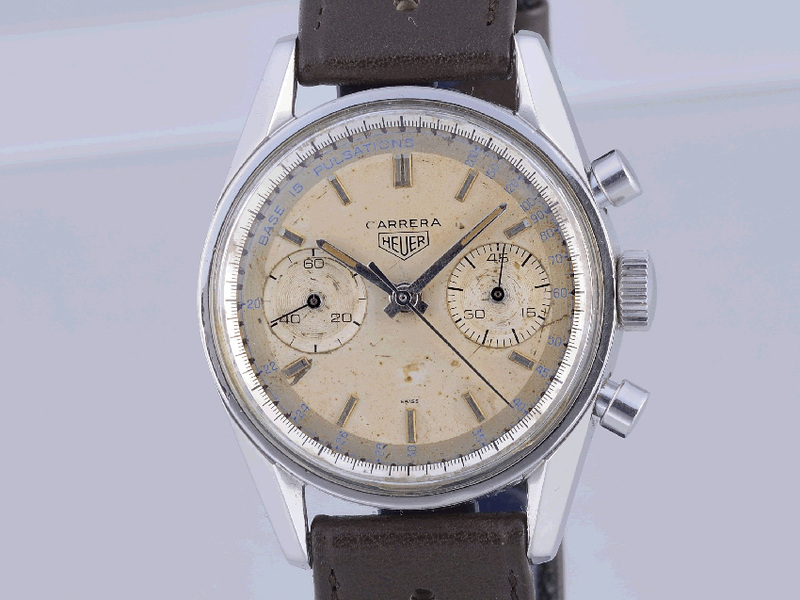 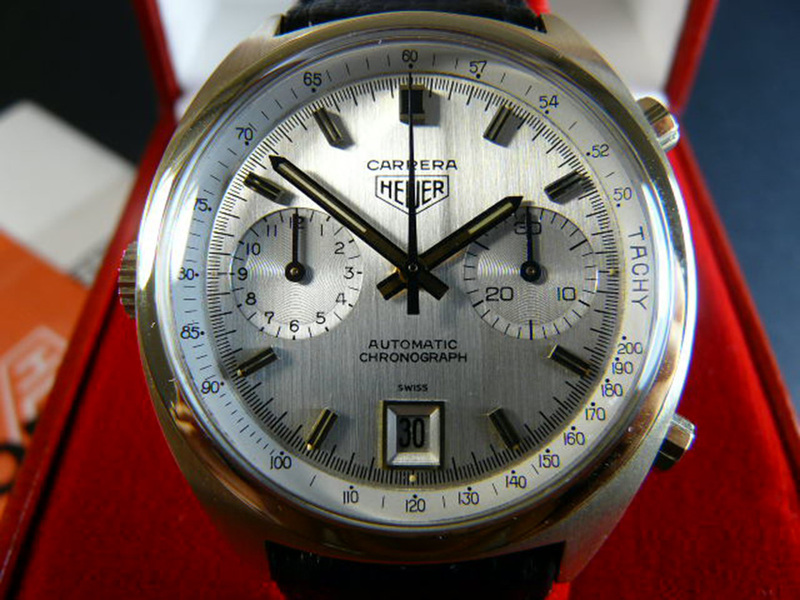 In 1963 "Heuer Carrera" was launched to the public. 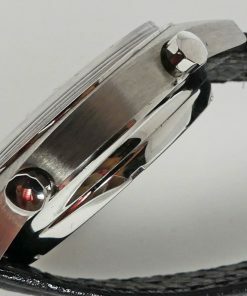 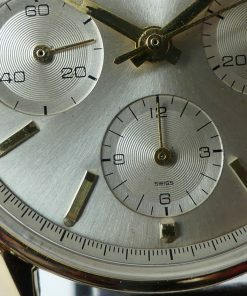 The watch was elegant in íts simplicity, the dial with two or three subdials was extremely clear and easy to read. 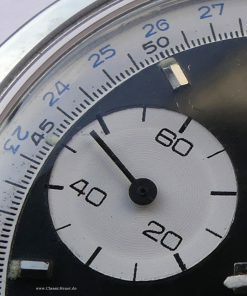 Tachymeter and decimal scales were the first variations in a very creative range of watches. 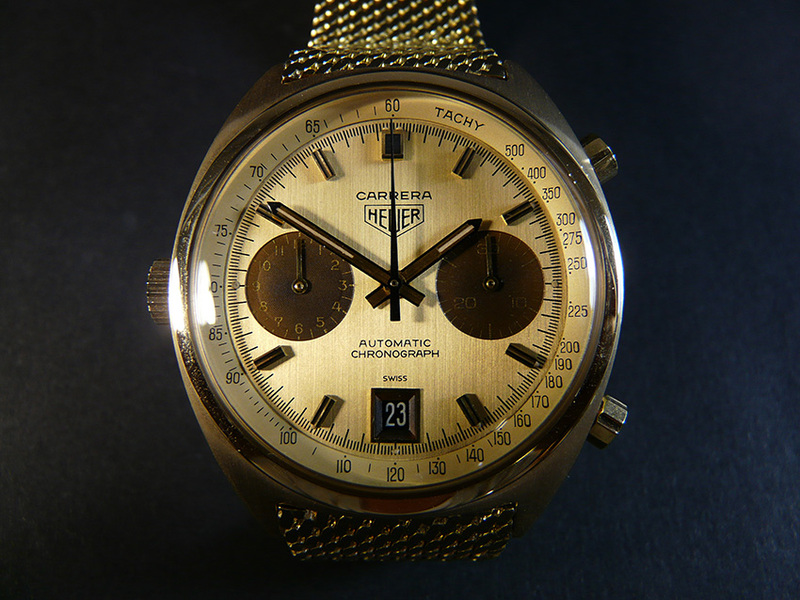 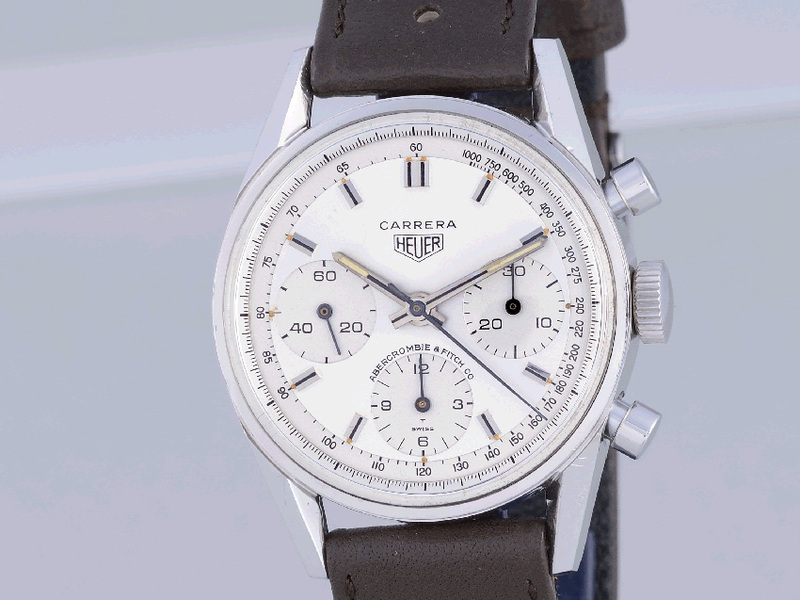 From 1963 until 1979 the Carrera chronographs have been produced with manual and automatic movements. 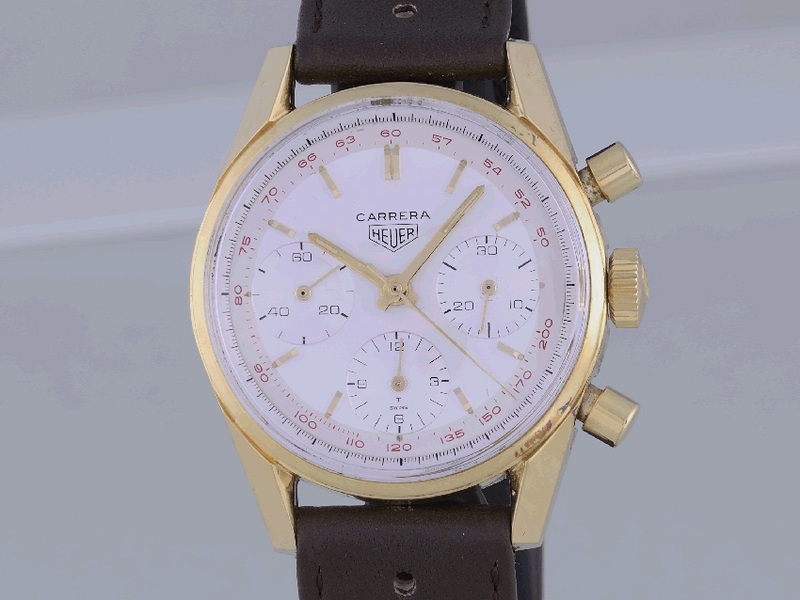 The name "Carrera" means competition at the highest level and finds its origins in Spanish. 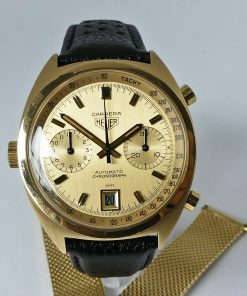 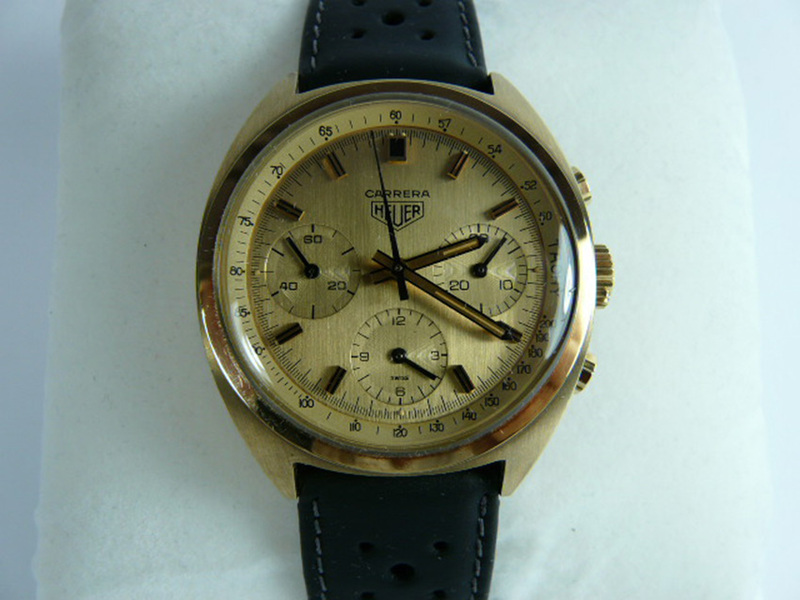 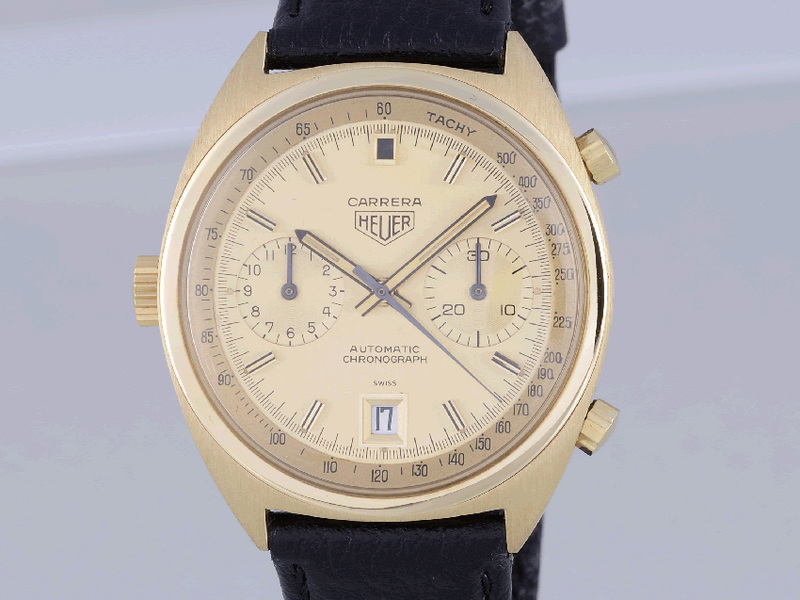 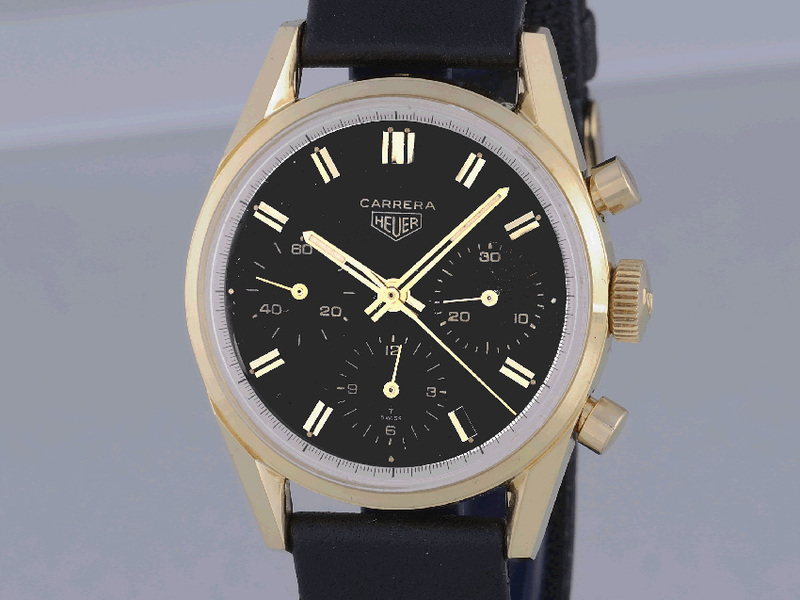 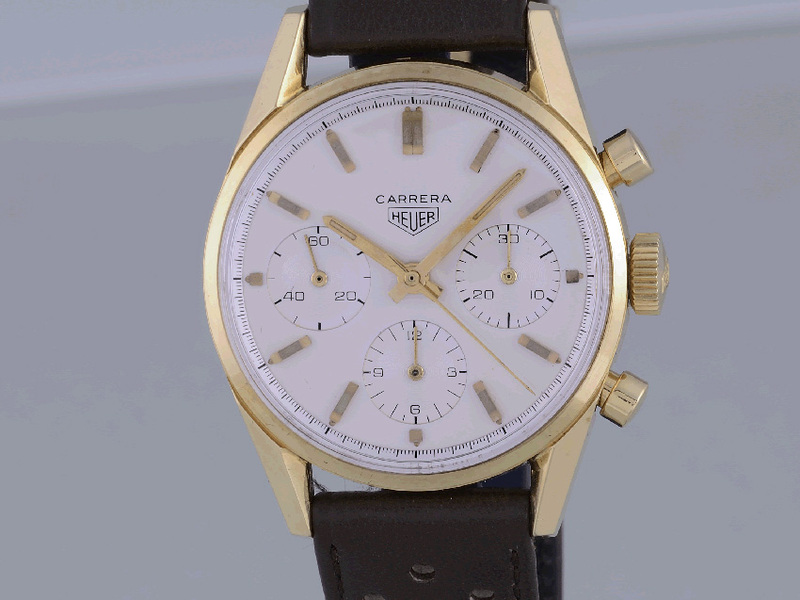 A limited edition of Heuer 18k gold chronograph Heuer Carrera ref. 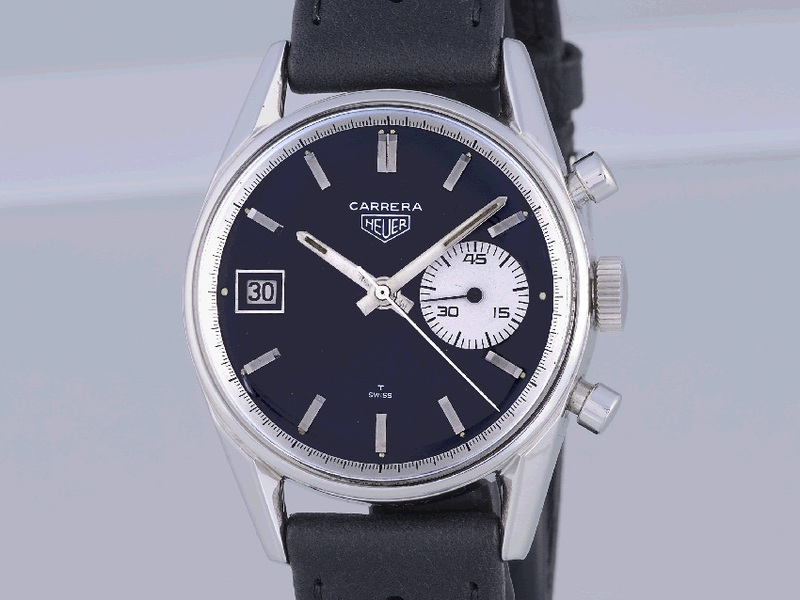 1158CH was produced in a quantity of 150 pieces within the cooperation with Ferrari Scuderia and the successful racing team. 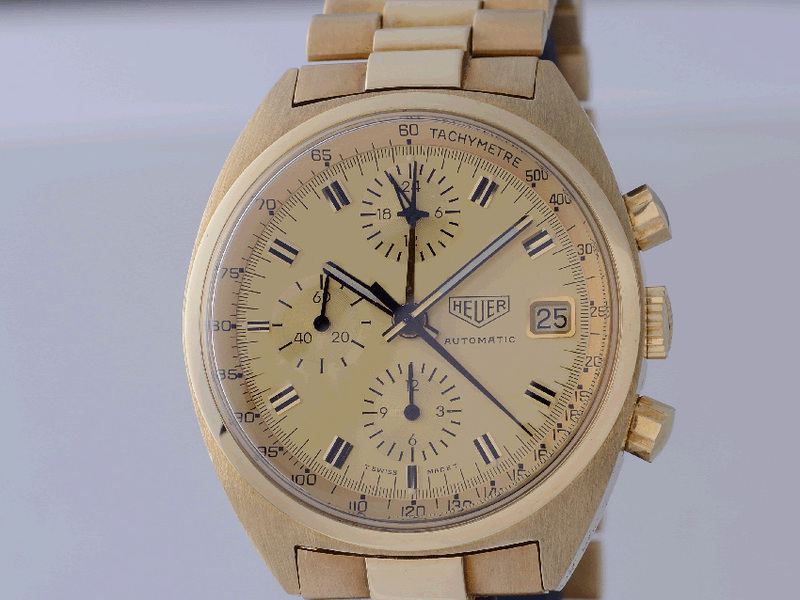 Ferrari racing drivers like Niki Lauda, Derek Bell, Jody Scheckter and Arturo Merzario as well as chief mechanics and team leaders have been wearing this beautiful 18k gold chronograph in mid of the 1970ties. 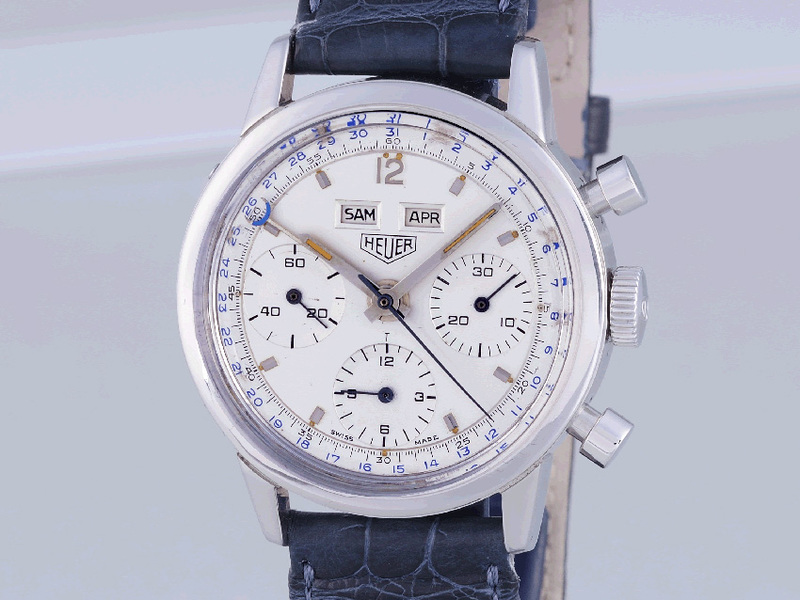 In 1969 Heuer achieved a sensational global success by producing the first automatic chronograph, powered by a micro-rotor, which enabled a flat movement construction. 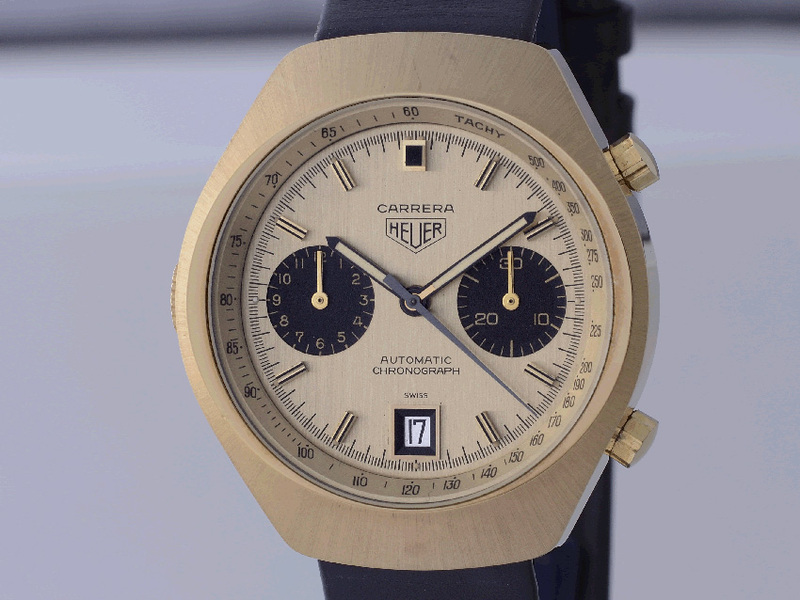 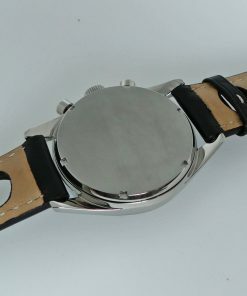 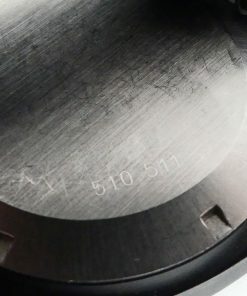 Autavia, Carrera and Monaco have been the first model lines in which the new movement cal. 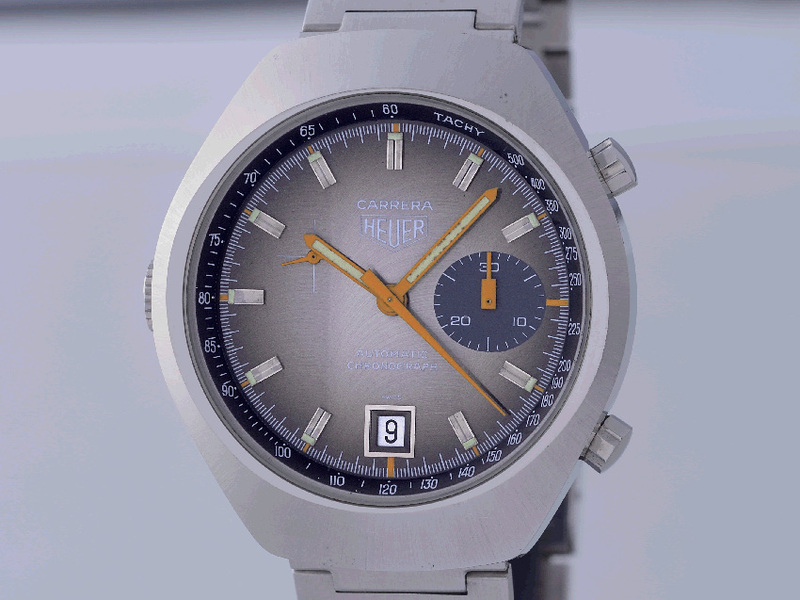 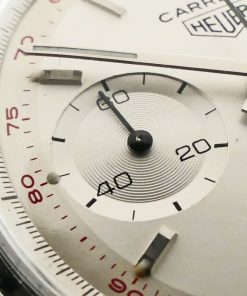 Heuer / Buren 11 was implemented. 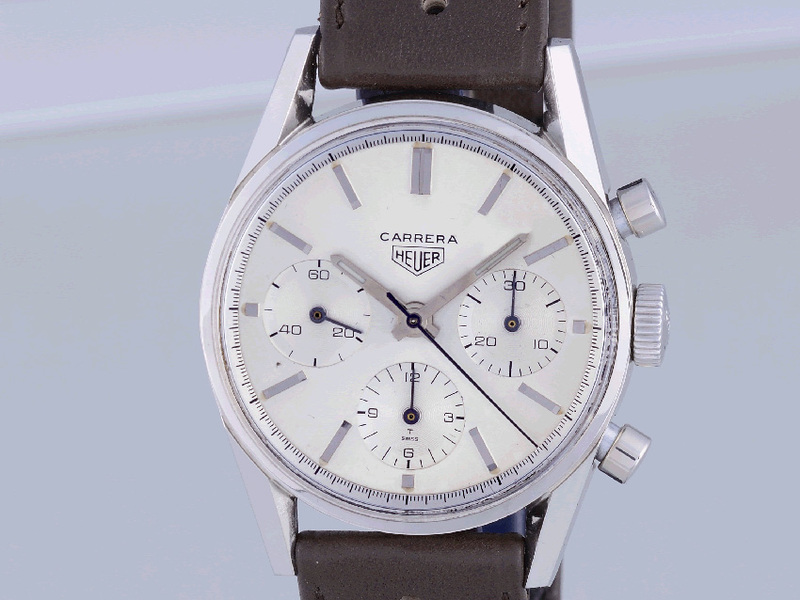 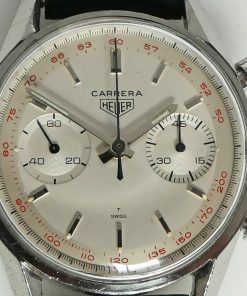 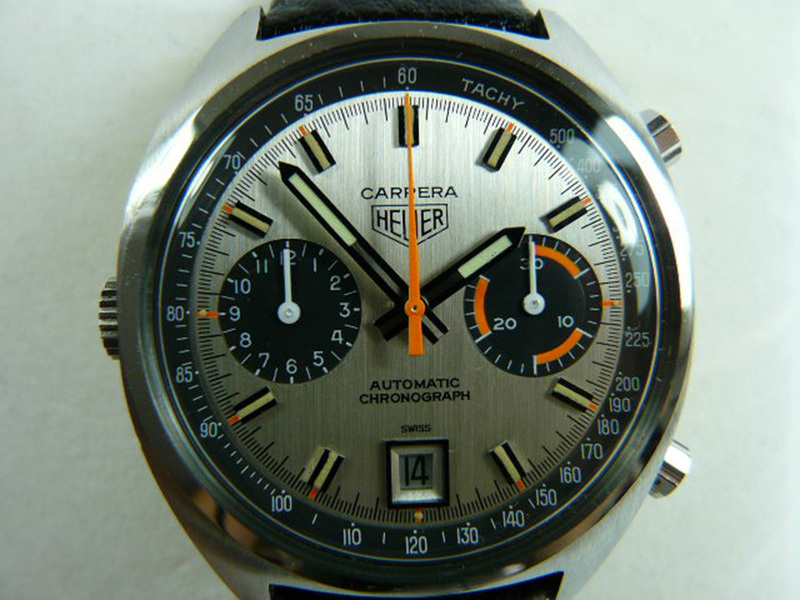 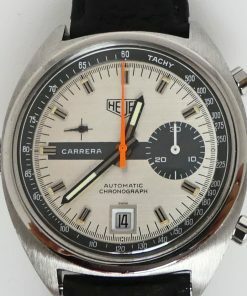 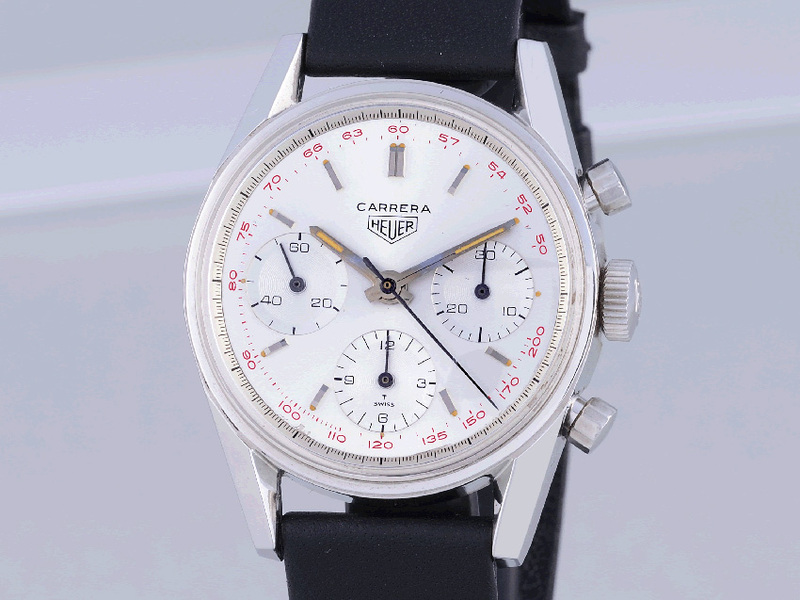 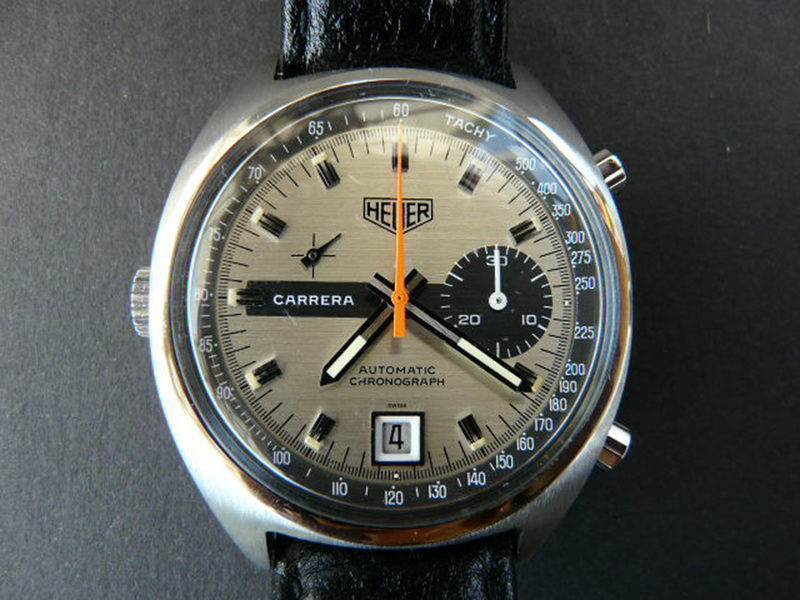 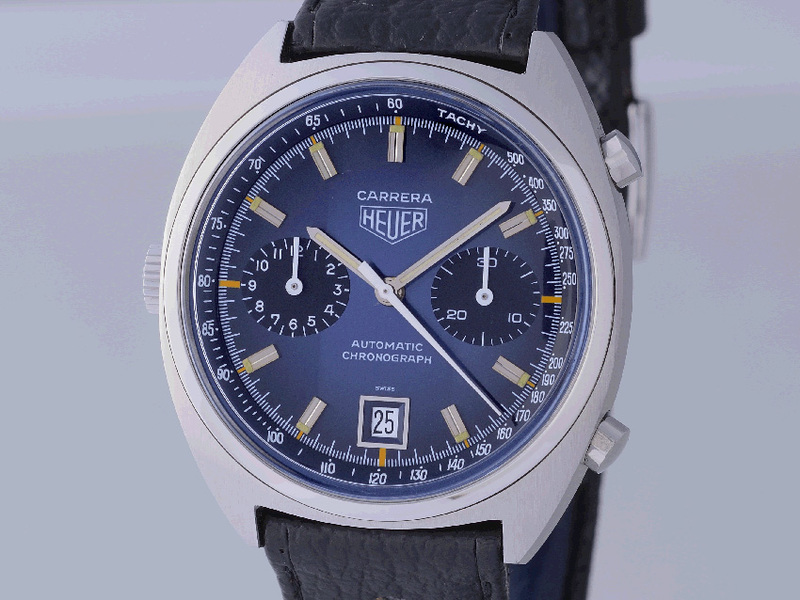 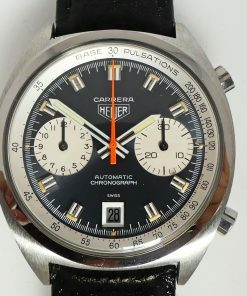 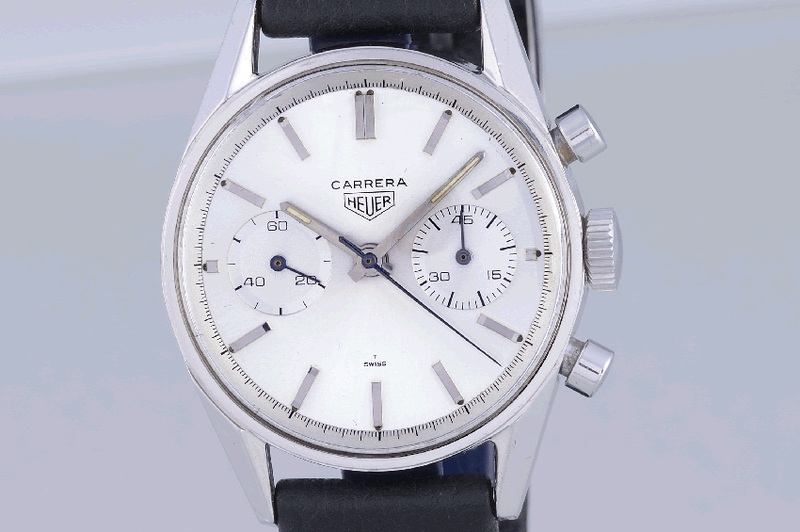 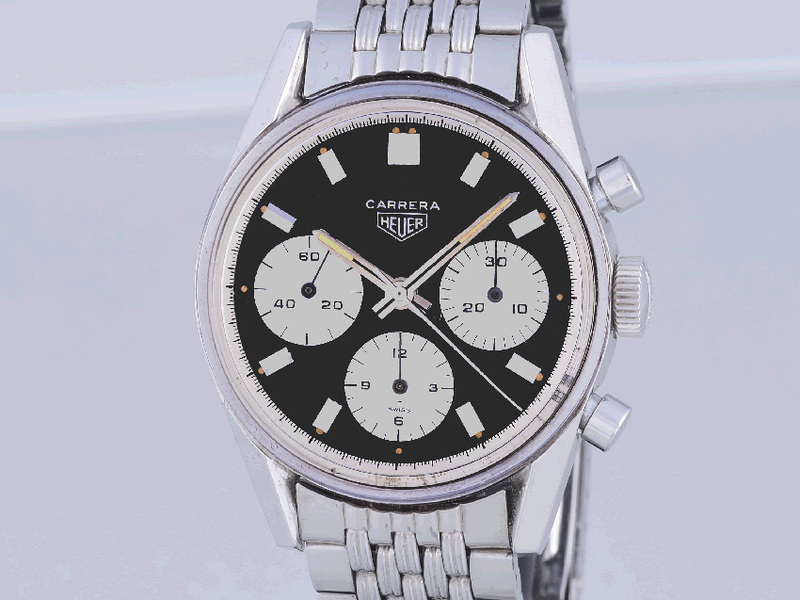 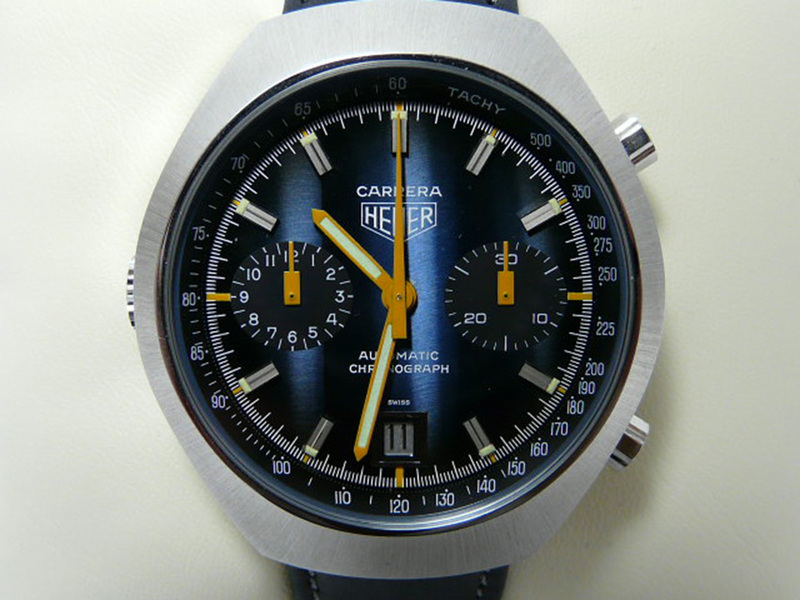 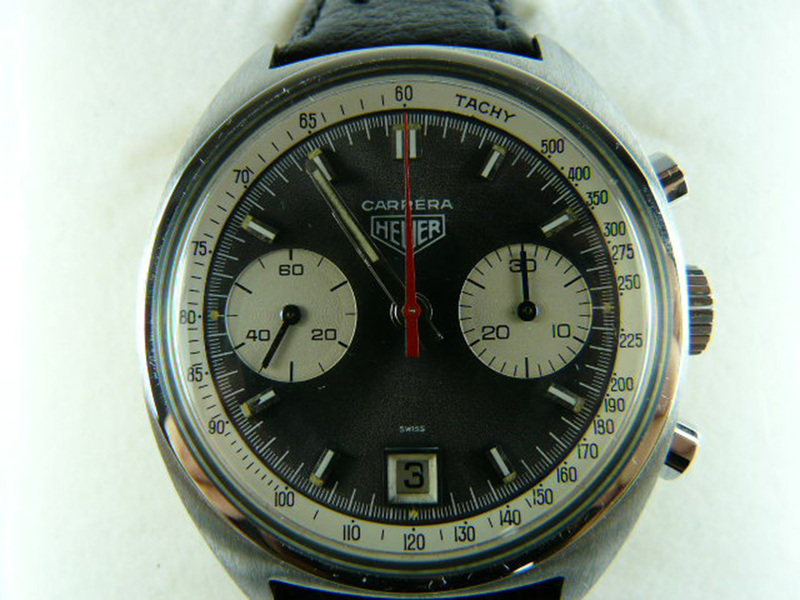 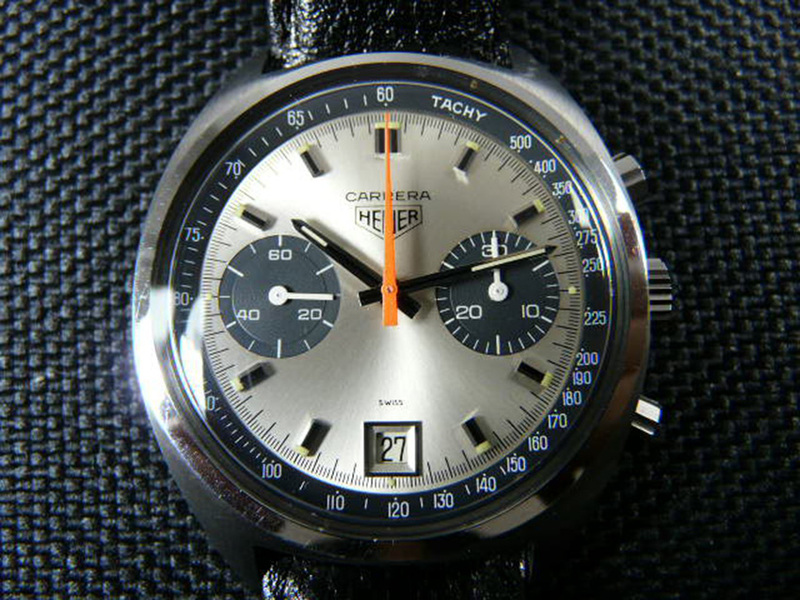 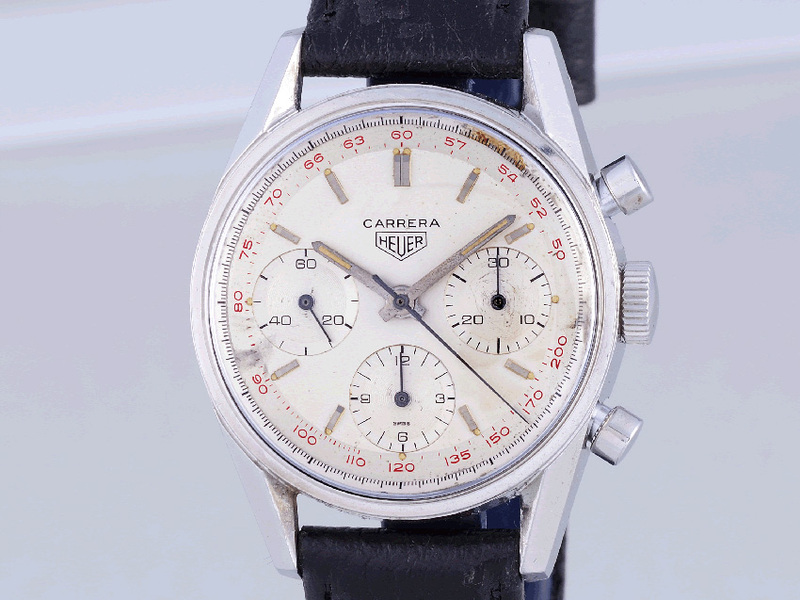 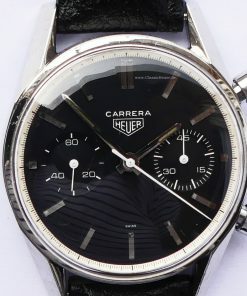 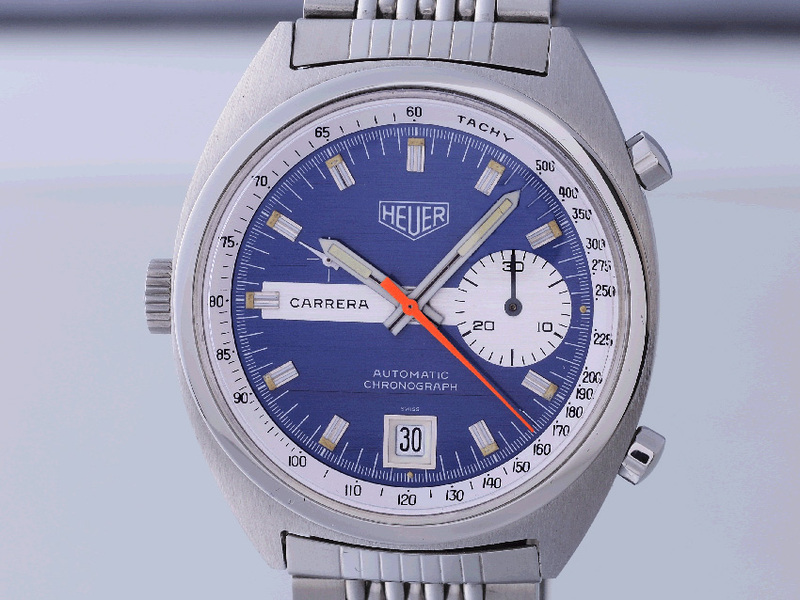 As one of the first racing chronographs Heuer Carrera was worn during the races f.e. 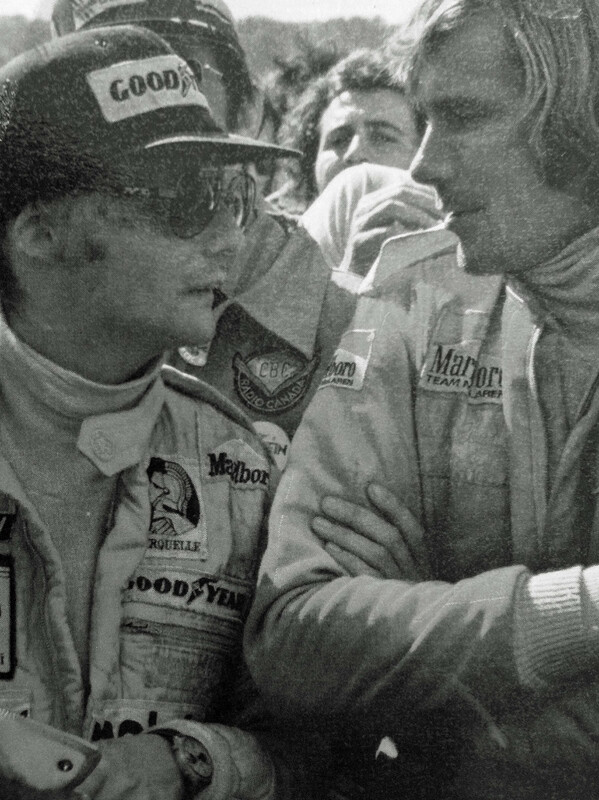 Juan Manuel Fangio, Nicki Lauda, James Hunt, David Piper, Arturo Merzario, Clay Regazoni, Derek Bell and Ronnie Peterson.